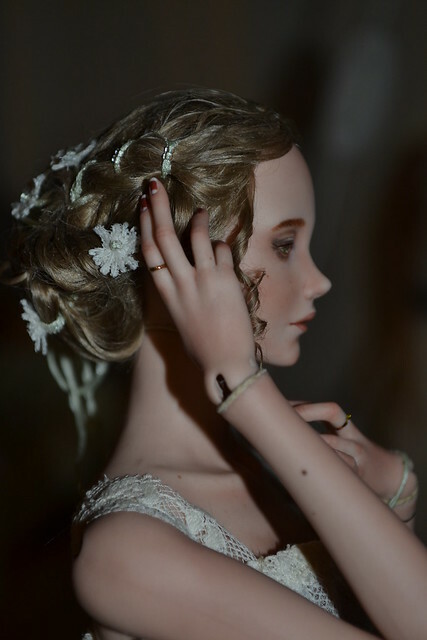 It turns out that the basic work for the "Art of Doll" exhibition falls on autumn and the beginning of winter. For me, this is a quite unusual, mystical period of the year, when nature slowly falls asleep and begins dreaming ... When the wind howls outside the window in the evenings, and the grotesque bare silhouettes of trees draw mysterious signs against the dark sky. All this creates a certain mood, and this time I spent a lot of time reading various gothic and fantastic literature. So the characters I have made turned out not quite common! And I named my little collection - 'A dream in a winter night'. So I introduce this girls. She is the owner of her harsh land and a hunter, but she doesn’t need a weapon to hunt. At the right time, sharp teeth and claws will come to help her, and soft paw pads will take the place of heels. Having taken the shape of a wolf, she loves to walk among the sparkling snows enjoying the northern lights. The doll is made of porcelain, painted with china paints and liquid gold, lined with leather, assembled on an elastic cord and has 20 points of articulation. Magnetic wig made of mohair. The doll body is encrusted with cubic zirconias. Size - about 35 cm on high heel feet. For accessories I used beads, lace, natural silk, plastic, viscose, leather and acrylic paints. The doll belt made of gold-plated silver. Lucy is one of the victims of the bloodthirsty count in Bram Stoker's famous novel "Dracula". Stoker shows Lucy a beautiful, vivid and pure girl. The vampire got her shortly before the wedding and Lucy was buried in a white dress. Therefore, in her reborn form, she appears as a bride. For accessories I used beads, lace, natural silk, plastic, leather and acrylic paints, coral, cubic zirconias. 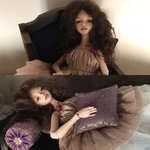 This doll is available for reservation. Olivia - a medium girl. It is believed that in the 19th - first half of the 20th century, the fascination with spiritualism and esotericism in America and Europe reached the highest point of popularity. People with increased mental sensitivity began to emerge from the shadows and openly declare their unusual abilities. Of course, someone was exposed, and someone later by themselves confessed to fraud. But there were those who fought for an honest name to the end, being subjected to public censure and even persecution. No one could officially confirm the supernatural abilities of these people, but they also failed to refute them. Olivia is a character with combined features of many persons, a girl who can see other worlds. She uses her gift to help people in need when they have no one else to ask. For accessories I used beads, antique lace, batiste, natural silk, plastic, leather and acrylic paints, cubic zirconias, glass. More pics you can find on my Flickr page. tanoy13 Thank you a lot!